Yesterday’s wide spread down bar on the usd to cad daily chart, added further momentum to the decline of the usd cad currency pair, as they speed towards our interim target of 1.08 once again. 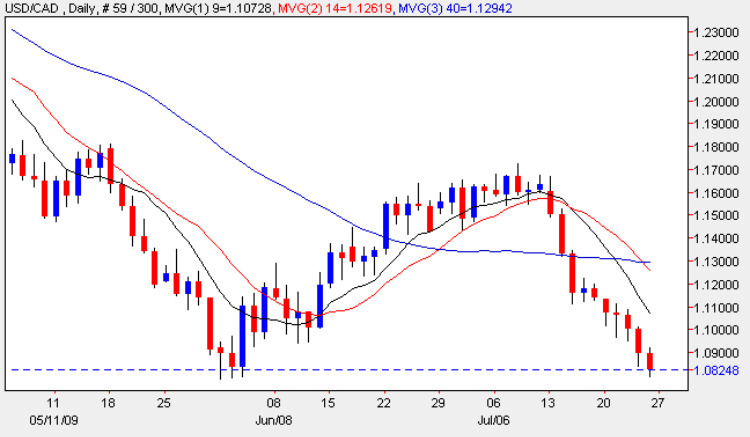 With the 14 day moving average diving below the 40 day moving average, this is adding further pressure to the bearish move lower, and only the interim support at 1.08 now stands in the way of a much deeper move, possible to re-test the 1.05 level in the short term, and parity in the medium term should the US dollar continue what seems to be a terminal decline against other major currencies. However, before we become too complacent, many analysts are now suggesting that we may see a US dollar recovery with a bounce in the medium term as risk appetite for equities falters, with a consequent return to the safe haven status of the US dollar. With no fundamental news in Canada today, the focus of attention has been in the US and in particular the markets are now waiting for more testimony from FED Chairman Bernanke,who is due to testify, along with Treasury Secretary Timothy Geithner and Federal Deposit Insurance Corporation Chairman Sheila Bair, on regulatory restructuring before the House Financial Services Committee, in Washington DC.